Austin, Curtis, Blaine and Gary. 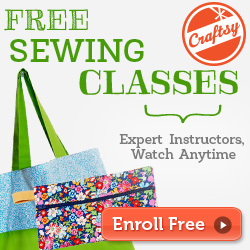 Check out all the free classes Craftsy has to offer. Glue (I used hot glue). Coloured paper or construction paper. Fold in one side of the tube. Flip tube over and fold the other side in the same way. Cut a piece of paper to evenly fit around your tube. Wrap the paper around the tube. Glue one end to the back of your tube. Lap the other end of the paper over the glued edge. Glue in place. Add your stickers. Glue on your googly eyes or buttons. For the owl we simply cut out wings, beak and eyes from coloured paper. Open one end of your box to insert your candy or gift. Make sure your ribbon is cut long enough to fit around your box. Tie the ribbon around the box to finish. Here's a pillow box we made for Valentine's Day! Introducing my little model, Gizmo. Gizmo is my Dear Head Chihuahua. He is approximately 1 1/2 years old. Last night I sat up in bed working on a crochet sweater to fit this little guy. He enjoys it so much that he fell asleep while I took his picture. Chest = 15 1/2 inches. Neck = 10 1/2 inches. Shoulder blades to base of tail = 14 inches. You can try this project on your chihuahua as you work. Red Heart Super Saver Stripes Yarn. Medium 4. Colour Cool Stripe. 1 Larger button (optional for collar). Approximately 4 rows = 2 inches. Approximately 6 hdc = 2 inches. I measured my gauge on body of finished project. I've included some measurements along the way. Mnr = Mark New Row/Round. Collar should measure approximately 5 1/2 inches X 10 inches. Fold project in half, lining row 1 evenly up to row 18. Evenly ss through bl of both rows at same time, forming a tube (collar). Working right to left, ss 6 times across to next 'hill'. Patons Grace Yarn. Light 3. Color: Sky. Darning Needle (for sewing in ends). Approximately 10 sc = 1 inch. Approximately 6 rows = 1 inch. Add a pompom to the top of the hat. You can make your own using the following video (using only 2 fingers) or purchase one. Sew it on. If you love the pillow and scarf you can get the free pattern here by clicking on this sentence. I bought my daughter this Fingerling/Happy Monkey for Christmas and she fell in love with him instantly. He is an interactive little monkey that holds onto your finger, makes silly noises when he swings by his tail. He blows back kisses and snores. Now he can snuggle up with his new blanket and pillow and snore happily. This pattern was fun to make up and didn't take very long to make, using mostly half double crochet(hdc) and single crochet(sc) stitches. My daughter played for hours after I completed this project. Fold project in half. Pin corners together. Round 1: Ch 1. Turn. Working through both sides of folded project. Sc in next st. Sc in ea st around, placing 2sc in ea corner st, and leaving a few sts unworked. Stuff the pillow with a bit of cotton. Sc in remaining sts around. Ss to join. Fasten off. Sew in ends. 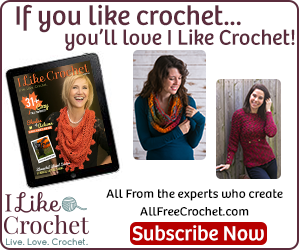 First of all ~ Get your free copy of this fantastic and fun crochet pattern here. The Crochet Butterfly Afghan Block is designed by Dearestdebi. Be sure to like her on Facebook to keep up to date with her current designs. I recently had the pleasure to test out this amazing pattern. Using yarn from my stash, and armed with a 6.5 mm hook I plugged away at this wonderful creation by Dearestdebi. I used a variety of yarns so my square turned out larger than Debi's. I know when I make more of these squares I would love to try using the yarns she has listed in her patterns. Like many others, I am trying to use up some of my ever growing yarn stash. This pattern is extremely well written and includes great photos to help with construction. Debi did a fantastic job designing this pattern, as she always does. To be able to create something so beautiful takes a beautiful mind, patience and alot of time. It is truly a labour of love that you too can create in only a few hours. Seriously! I finished mine in less than a day, while my kidlets were away at school. I took breaks. Lots of breaks, but if I were to time it, it would have been under 3 hours. My daughter absolutely loves the little butterflies that hover over the flowers in this garden of roses. She had a friend over the other day that was amazed by the beautiful design. She begged me to make one for her dolly. Wouldn't that be a fabulous Christmas gift? I personally would love to make a pillow with this one. It would look great alongside my Twist & Shake Square Pillow that I created using my Twist & Shake Square. Do you love this pattern as much as I do? 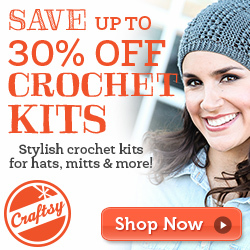 Check out this Free Pattern Here! Are you are feeling super inspired? Check out all her beautiful patterns! See more of Debi's patterns on Ravelry. Recently I injured my back. I had lots of time to rest while waiting to see a Chiropractor. I decided I needed a quick and easy crochet pattern to make a blanket for my daughter's birthday. 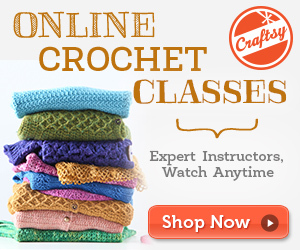 I found the C2C (Corner to Corner) Throw pattern >HERE<. I used yarn from my stash, to match the pillow I created from my Twist & Shake Square pattern.